RFG: Tell us a little about yourself and how you got into the music industry? Gia Yee: I’m a reggae music artist, a singer/songwriter, and someone who’s passionate about a lot of issues, a little more introverted then you might think, and really excited about being able to share my new passion and reggae music. I began my music career at the beginning of 2016, and everything pretty quickly progressed from there. I formed a company called One Heart Entertainment, so that I could produce my own songs, and by May of 2017, released a self-titled EP that introduced me to the reggae world. My ultimate goal was to produce a full-length album that expressed all that I wanted to say (for now) – so I immediately went back to work on new songs … and then back to the recording studios in Jamaica … and I’m now very thrilled to say, that my very first album: REGGAE PRESCRIPTION … was just recently released on August 31st, 2018! RFG: Tell us about your latest music project? 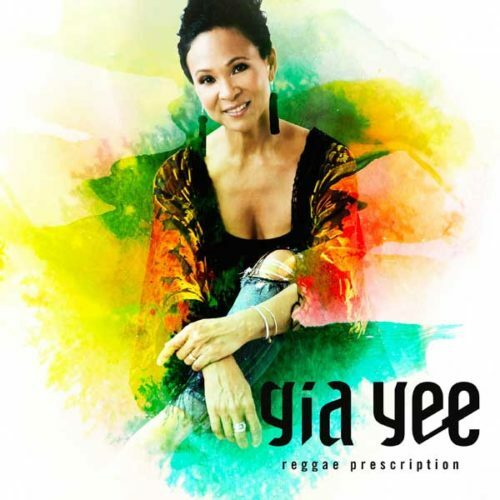 Gia Yee: Aside from being thrilled about the release of REGGAE PRESCRIPTION, I’m really grateful for how everything fell into place, and feel truly blessed to have had the opportunity to work with so many of the top musicians and producers in Jamaica. I describe my new album as a cultural roots reggae fusion mix. Delivered in my smooth signature kind of style. I stay true to the roots of reggae, and infuse some unexpected touches of ska beats and dancehall riddims, a little classic funk and vinyl, some R&B, and just a hint of EDM – to keep things interesting and fresh. My new songs include roots reggae conscious-raising tracks “GASLIT”, “BOTH FEET”, “ERASED”, and “ANYTHING”; two renditions of a Ska influenced song called “NOTE TO SELF”; an upbeat funk infused cultural blending love song called “YO RASTA”; a Dancehall and EDM influenced tune entitled “MY AVATAR”; a smooth lovers rock track called “ISLAND NIGHTS”; and the ballad of “RASTA JACK”, which I intentioned to illustrates what I believe, true love looks like in its most simplistic form. I chose the title REGGAE PRESCRIPTION for my new album, as I felt it chronicled, and was representative of my transformational experience. I believe that music is such a powerful and healing force, and you’ll often hear me say that ‘writing music is my therapy, and reggae music is my refuge’ – so REGGAE PRESCRIPTION – just sounded right. RFG: Does your work comment on social or political issues? Gia Yee: Though I have yet to address any political situations, I do address what I feel are important present day social issues. I write from both a personal and retrospective perspective, and try to subtly approach issues such as relational and familial dynamics and dysfunction, manipulation, alienation, abandonment and abuse, contrast and duality, awareness and accountability, growth, universal truths and faith – yet also include and highlight some other more lighthearted contemporary issues, such as how our society and culture now communicates through the use of emojis and avatars J.
RFG: What does your work aim to say? Gia Yee: My aim is to connect with others in a thought provoking and meaningful way. I chose my words carefully and try to offer a positive outlook, even if the subject matter happens to be a sensitive or emotional one. Music is a powerful tool, so I try to stay reverent to that fact, and ultimately offer a positive vibe and messages of hope, peace and love. RFG: What’s next or on the horizon for you and your music? Gia Yee: At the moment I’m working on marketing for my new album, and connecting with radio, media, fans and supporters. As soon as I catch my breath, I’ll then be gearing up for future performances. I was recently invited to perform in December at the Reggae Village, Reggae in the Sun Festival at the Trelawny Stadium in Falmouth, Jamaica – which I hope to attend, and a European Festival Tour for Summer 2019, is currently in the works. In the meantime I’m hoping that my loyal supporters and new listeners will stay tuned, find and follow me on my website, my YouTube Channel, and on Spotify, iTunes, AmazonMusic, CDbaby & on the social media sites, Facebook, Instagram & Twitter.